The proposed changes to the residential zone controls put forward by the Victorian State Government via Amendment VC110 were gazetted on Tuesday. While the amendments effect the General Residential Zone (GRZ), Residential Growth Zone (RGZ), and Mixed Use Zone (MUZ) it’s the removal of the two-lot subdivision restriction in the Neighbourhood Residential Zone (NRZ) that is perhaps most notable, effectively increasing development potential in the NRZ. Data provided by Landchecker.com.au shows that in select suburbs across inner and middle Melbourne where the NRZ has been implemented by councils, quite a substantial amount of these properties have large block sizes. Until now, the two-lot subdivision restriction has forced developers who are looking for sites to accommodate multiple dwellings to focus outside the NRZ and more towards the GRZ, RGZ and MUZ. Ed Farquharson from Moda Corp believes the changes will ensure developers will take another look at NRZ properties. "These changes will result in developers targeting areas that were previously restrictive." "It's now possible for developers to consider design responses which incorporate multiple dwellings in quieter neighbourhoods with larger blocks of land" says Farquharson. Ratio consultants have provided a summary of changes on their website. Removal of the previous restriction on the maximum number of dwellings per lot. Amendment to the purpose of the zone to remove the previous references to limiting opportunities for increased residential development and the implementation of character policy/adopted guidelines. Requiring that the schedule to the zone must contain the neighbourhood, heritage, environment or landscape character objective for the area to be achieved. The introduction of a mandatory minimum garden area requirement for lots greater than 400 square metres and above ranging from between 25 and 35 per cent of lot area (irrespective of whether a planning permit is required). A mandatory maximum height of 9 metres and 2 storeys with potential to exceed this height only in particular circumstances including on sloping sites, land subject to flooding and existing/adjoining building heights. Revised transitional provisions which amongst other things seeks to exempt planning permit applications for the construction or extension of a dwelling lodged before the VC110 approval date. 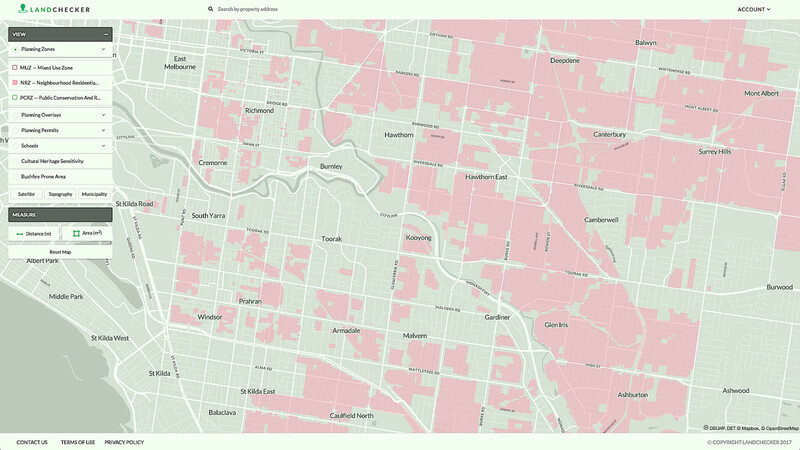 In analysing the plethora of NRZ properties in Melbourne, Landchecker.com.au have chosen to highlight how many 1000+ m2 NRZ properties there are in select suburbs.